The leaves in the Hudson Valley are just beginning to color as the temperatures finally start to dip. That bracing breeziness reminded me that outdoor patios in the Northeast will be closing up for the season in a couple of weeks. So today the Doggy Bagger will take a tour of dog friendly restaurants in the Berkshires. “The Berkshires” refers to the portion of the Green Mountains that extends into Massachusetts. 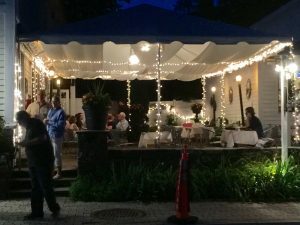 I’m also going to include dog friendly restaurants in the Litchfield Hills in Connecticut, which is the southernmost reach of the Green Mountains. If you’re driving up from points south, you can hit both areas in the same day. And if you plan to stay overnight, consult Petswelcome.com for pet friendly lodgings. 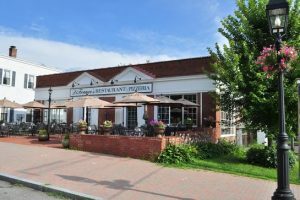 Now, let’s take a look at your options for dog friendly restaurants in the Berkshires and Litchfield Hills. In the quintessentially picturesque town of Litchfield CT, you have two different dog friendly options for dining. DiFranco’s Restaurant offers straight-up old school Italian-American fare—pizza, calzones, and Italian subs; chicken and veal cutlets a la parmigiana, francaise, piccata, marsala, cacciatore, Florentine, or saltimbocca; and pasta with your choice of sauces and toppings. Sit down on their roomy dog friendly sidewalk patio and let mama feed you. Litchfield Saltwater Grille lets you indulge your love of seafood on what they advertise as “Litchfield’s largest patio.” Relax with your pooch, and choose from its many seafood offerings, like Tuna Poke Taco Salad, Spicy Parmesan-Dijon Encrusted Cod, and Grilled Shrimp and Lobster Tail. They also have a raw bar, including a Seafood Tower and Oysters Alaska, oysters on the half shell topped with smoked salmon, caviar, and horseradish cream. If fish isn’t your thing, that’s fine—choose from items like Baked Mac and Cheese or a New York strip loin au poivre served with brandy demi-glace. You can also toast the season with one of their autumn-themed cocktails, like Leaf Pepper Martini, a flavorful blend of apple cider and Hennessy served with a cinnamon sugar rim. Lenox MA is the home of Edith Wharton’s estate, The Mount, as well as two wonderful dog friendly restaurants. Prime Italian Steakhouse & Bar features a lovely covered patio where you can enjoy homemade gnocchi topped with red sauce, creamy pesto, Bolognese, or gorgonzola sauce; Caprese salad finished with a truffle glaze; and, of course, your choice of filet mignon, strip loin, or rib-eye, as well as many seafood offerings. You’ve got to love a place that includes homemade sausage along with the fries and seasonal vegetables as an option for sides! 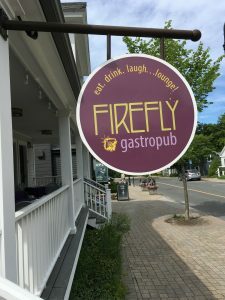 Firefly Gastropub offers a deliciously eclectic menu and a dog friendly back porch, complete with ever-present water bowl. Celebrate the change of season with Marinated Butternut Squash with bourbon-caramelized onions and crispy sage, or their fall-themed Lava Lamp cocktail, equal parts prosecco and hard dry cider. Firefly also has a traditional or off-the-grill Caesar salad you can “entrify” with grilled chicken or shrimp, bacon bits, or a fried farm fresh egg. Nachos, burgers, lobster roll, house-smoked baby back ribs, grilled trout, Firefly will be sure to satisfy. Home to Williams College, Williamstown is a perfect destination for leaf peeping. When you’re ready to refuel, you’ve got two excellent choices. 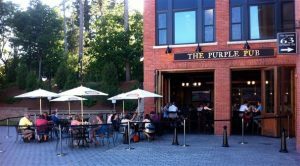 The Purple Pub is right in town, with a dog friendly patio where you can watch the world go by. Order a beer or glass of wine, and satisfy the munchies with Greylock Fries (topped with cheddar and smoked bacon), or any of their burgers or paninis. They also offer a stellar selection of salads (Cobb, Mediterranean, Greek, Quinoa, etc.) with your choice of dressings and toppings. The ‘6 House Pub is one of our favorite dog friendly restaurants. 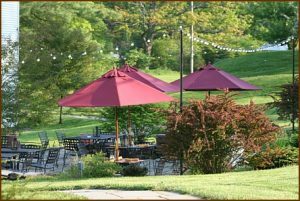 First, its patio is everything you want outdoor dining to be, a terrace set in an expansive green lawn with beautiful plantings all around. Second, they are dog friendly with a capital D, offering a Bone Appetit Doggie Menu. Lastly, the human food is delicious, including pub classics as well as an impressive lobster roll and substantial fare like steak frites and blackened sesame-crusted ahi. A wonderful place to sit and watch the season change.